Ringtail joins the moderate Rainbow Buttress route which climbs the right side of the huge Black Tower. It is unlike the other climbs on Eagle Wall, with awkward crack and corner climbing, stemming, and a very thin edge crux traverse on a steep slab. 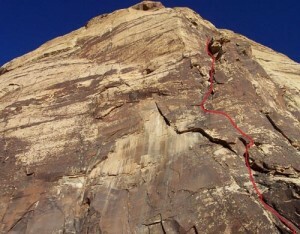 The climbing is reminiscent of the technical faces and corner climbs of Black Velvet Canyon. Which SuperTopo guidebooks include a topo for Ringtail?